India is expected to be the fastest growing economy in Asia and will reverse two years of declining growth to clock 7.3% rise in GDP in the current fiscal and further accelerate to 7.6% in FY20, the Asian Development Bank said in its forecast for the region. The dip in growth to 6.6% in FY17 was in part due to the lingering effects of demonetisation that impacted the informal sector in the first half of FY17 and teething issues related to implementation of the GST, the ADB said in the latest Asian Development Outlook 2018 report. It expects various reforms measures to lift growth. According to India’s official estimates, the economy picked up pace to 7.2% in October-December 2017 quarter from 6.5% in July-September quarter and 5.7% in April-June quarter. For the entire FY18, the economy is expected to grow 6.6%. The Reserve Bank of India expects 7.4% growth in FY19. China is forecast to slow down from 6.9% in 2017 to 6.6% this year and further 6.4% in 2019. 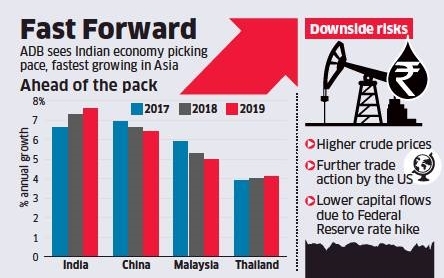 "India would remain the fastest growing country across Asia," ADB India country director Kenichi Yokoyama said but flagged rising NPAs and crude prices spiking to over $70 a barrel as risks. India’s growth will get support from measures to bolster farmers’ purchasing power through higher procurement prices, agriculture market reforms and investments in irrigation and logistics, the Manila-based bank said. “Investment revival is expected to continue, albeit at a modest rate, as firms and banks strive to improve their balance sheets, and capacity utilization levels pick up,” it said in a statement. Inflation is forecast to rise to 4.6% in FY18 and 5% in FY19 due to firmer global commodity prices and stronger domestic demand. “The uptick in inflation along with deferment of fiscal consolidation and expected hikes in the US Federal Reserve’s interest rate has reduced the room for policy rate cuts to stimulate growth,” it said. A pick-up in growth in advanced economies will likely help exports grow at a healthy rate, but the ADB added that though protectionist trade measures by the United States are yet to impact trade, they pose a risk.